We have an ad for Dahlia, if you or anyone you know is interested in a wonderful friend check this out. 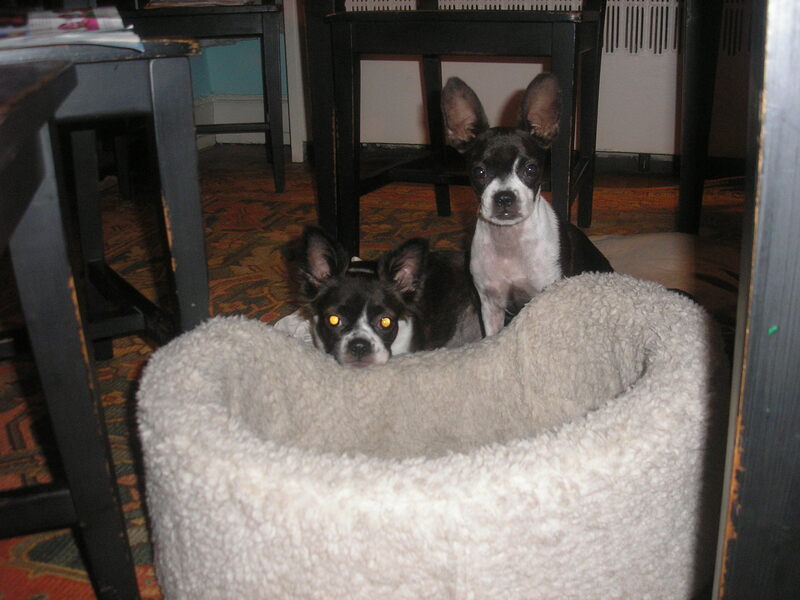 Also, my rescue group, Northeast Boston Terrier Rescue is desperately in need of funds. All of the our dogs require a lot of medical attention and the adoption fees don’t cover it. Dahlia, so far, with nothing wrong has cost $510.00 and she still has to get her teeth fixed. So if you’re not in the market for a pup but are interested in donating –we’re selling a variety of items as well as raffle tickets for a stunning quilt! AND THANK YOU FROM ALL OF US! I haven’t posted in a while because it’s been wicked busy. I have a new foster — a ten year old with a mess of issues (fatty masses, rotten teeth, bald spots, warts). She’s been sad and not eating. I told her she should be happy because this is a top adult living facility. So far, she just sleeps a lot. Poor girl was dumped in a shelter in Brooklyn by some heathens. In other news, Violet starts kindergarten next week. She has to wear a uniform of light blue shirt and navy blue jumper. In case you haven’t sensed it, neither of those colors are pink. We are hoping to get a reprieve from the Governer. I’ve got two temporary fosters here –Lizzie and Sarah –both BT mixes. They’re pretty darn cute (if a little long in the noses and ears). Enjoy! A fan of my blog recently told me how boring she thinks it is when I talk about other people’s work, so I’m not going to say one single word about my brilliant former teacher, Lynda Barry. Instead I’ll just post one of my favorite comics of hers. Though I’ve never met Malachy McCourt, I profess a deep love for him. Many a time, when I feel down, I pick up A Monk Swimming only to have my frown turn upside down. I also relate to him as the sister of a better known writer than myself. This is from the FAQ of his website. Feel free to read it in a rich Dublin brogue.